Fast action under the Montreal Protocol can limit growth of hydrofluorocarbons (HFCs), prevent up to 200 billion tonnes of CO2-eq by 2050, and avoid up to 0.5°C of warming by 2100, with additional climate benefits from improvements in energy efficiency of air conditioners and other appliances. In November 2015, the Parties to the Montreal Protocol, recognizing the threat posed by the growth of hydrofluorocarbons (HFC), agreed on the Dubai Pathway on Hydrofluorocarbons to “work within the Montreal Protocol to an HFC amendment in 2016.” Ninety-five countries have submitted formal proposals to amend the Montreal Protocol to phase down HFCs, including a coalition of island States, India, the EU, the US, Canada, and Mexico, and the 54 members of the Africa Group. HFCs are the fastest growing greenhouse gases in much of the world, increasing at a rate of 10-15% per year. They are factory-made gases that were once thought necessary to replace ozone-depleting substances, but today are no longer needed in most sectors, including air conditioning, refrigeration, and foam insulation. 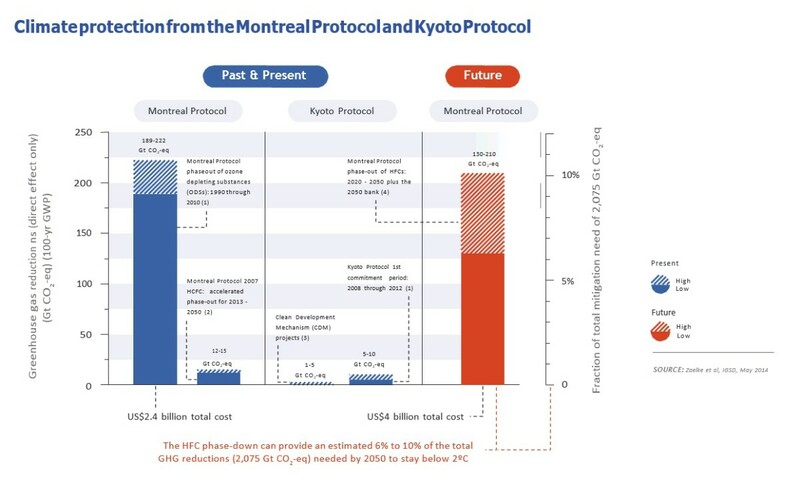 A fast phase-out of high-GWP HFCs under the Montreal Protocol by 2020 would prevent up to 200 billion tonnes (Gt) of CO2-equivalent (CO2-eq) emissions by 2050 (see Figure), and avoid up to 0.5°C warming by 2100, using a treaty that requires developed countries to act first, provides implementation assistance to developing countries, and has the experience and expertise to ensure that reductions are fast, effective, and efficient. This would also catalyze significant energy efficiency gains in equipment that utilizes HFCs, and provide additional mitigation of nearly 100 Gt CO2-eq by 2050 in the room air conditioning sector alone. An amendment to phase down HFCs under the Montreal Protocol in 2016 will provide a level playing field for producers and consumers in lieu of the growing patchwork of regional and national regulations. The agreement to amend the Montreal Protocol in 2016 also builds momentum for and complements the climate agreement being negotiated under the UNFCCC in December 2015 to go into effect in 2020. HFCs are very powerful greenhouse gases, trapping thousands of times more heat in the atmosphere per unit of mass than CO2. HFC-134a is the most abundant and fastest growing HFC; it has an atmospheric lifetime of 13.4 years and a GWP of 1,300. While HFCs have caused only 1% of total global warming to date, production, consumption, and emissions of these factory-made gases are growing at a rate of 10-15% per year. By 2050, global HFC emissions could reach the equivalent of 8.8 Gt CO2-eq, roughly equal to the current carbon emissions of the United States and European Union combined. The HFC amendment can avoid approximately 100 Gt CO2-eq by 2050, and up to 0.5°C by 2100. This can increase up to 200 Gt-CO2-eq by 2050 if parties eliminate high-GWP HFCs by 2020 using a “leapfrog” strategy during the current phase-out of H-CFCs. This would avoid between 91-146 Gt CO2-eq by 2050, plus an additional 50 Gt CO2-eq (39–64) that would otherwise be trapped in HFCs “banks” of products and equipment and ultimately emitted. A combined transition to low-GWP refrigerants and higher efficiency room air conditioners could produce savings in peak electricity demand equal to 544-1,270 gigawatts (GW) of electricity and avoid a cumulative ~98 GtCO2eq by 2050. This would avoid (or free up for other uses) an amount of electricity equal to the production of between 680 and 1,587 medium-sized peak-load coal power plants by 2030, and between 1,090 and 2,540 by 2050.